Bright golden straw with an color. Nutty, creamy aromas and flavors of cashew and sesame nougat, peach yogurt, flan, and chalk with a silky, bright, fruity medium body and an even, interesting, medium-to-long finish manifesting notes of spiced apple and kiwi, nectarine, and white strawberry with no oak flavor. A rich, round pinot grigio that evinces some flavor-infusing skin contact. 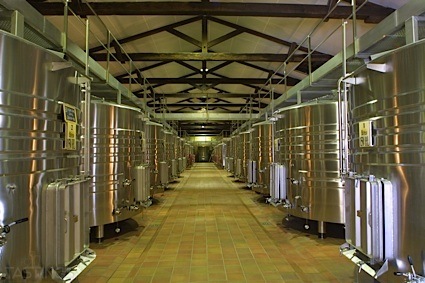 Bottom Line: A rich, round pinot grigio that evinces some flavor-infusing skin contact. 87 • Belle Ambiance 2014 Chardonnay, California 13.5% (USA) $9.99. 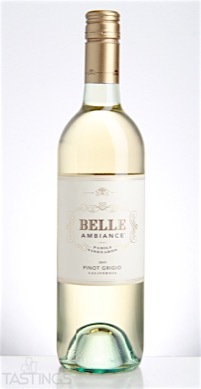 89 • Belle Ambiance 2015 Pinot Grigio, California 13% (USA) $9.99. 85 • Belle Ambiance 2015 Dark Red Blend, California 13.5% (USA) $9.99. 90 • Belle Ambiance 2013 Pinot Noir, California 13.5% (USA) $9.99. 88 • Belle Ambiance 2014 Cabernet Sauvignon, California 13% (USA) $9.99. 88 • Z. Alexander Brown 2015 Uncaged, Cabernet Sauvignon, California 14% (USA) $19.99. 86 • Z. Alexander Brown 2015 Uncaged, Pinot Noir, Monterey County 14.5% (USA) $19.99. 92 • Z. Alexander Brown 2015 Uncaged Proprietary Red Blend, North Coast 14.5% (USA) $19.99. Belle Ambiance 2015 Pinot Grigio, California rating was calculated by tastings.com to be 89 points out of 100 on 8/17/2016. Please note that MSRP may have changed since the date of our review.